Peasants Brawling over Cards is situated on three planes and Brouwer reaffirms depth in this work with two light sources; the first highlights the brawling subjects as it comes from behind the artist to the left, and the second comes from the fireplace. Brouwer painted the left half of the canvas in darkness to accentuate the presence of the three revellers as he paints them in bright and high color with a strong undercoating of white. 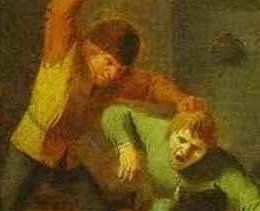 Brouwer also reaffirms the depth of this image by inserting items such as the jug and bowl on the floor in front of the brawling peasants. He uses the same technique for the hanging pot and shelf to the left of the fire place as he paints them in smaller range and in the distance to define depth in relation to the sitters by the fire place. With regards to the viewing process the eye is immediately drawn to the ma with his arm raised and the man he is grabbing. 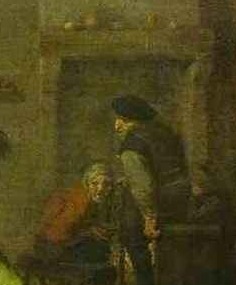 The gambler on the left who looks at the two men also reaffirms them as the focal point. The predominant shading used in this work is dark brown tones mixed with light greys. This helped recreate the hazy atmosphere caused by both the tobacco smoke and fire at the back of the tavern. Brouwer blends the browns used to depict the subject matter and their faces to make the shadow from the light source coming from the behind the viewer and the fire look as natural as possible. He also uses lighter browns in the centre of the three brawlers to show their shadows in the dim lighting. He uses blacks to detail the facial expressions of the brawling men and also uses light red over the white flesh tones for their flushed cheeks. Brouwer uses strong, bright greens in various tones and mixes these with dark blues for the central character's clothing. He also uses bright red in bold hues for peasant with his arm raised and the woman observing in the background as well as the pot and jug. The artist's use of bright reds here serve to highlight the action, reinforce depth and focus the viewer's attention on the central characters. In this way Brouwer also adds dimension using color emphasis and clear shapes. He also uses bright yellows as shades for the brawler's blonde hair and in the waistcoat of his attacker. This use of yellow creates a sense of harmony in the image, as it flows into the highlighted flesh tones and confirms the three brawlers as the focus of this image. Brouwer's brush work can be seen taking on very light and smooth strokes in Peasants Brawling over Cards. This work still demonstrates his Mannerist influences of bold outlines for the characters and objects. Brouwer's brush movements are short and brisk and he pressed hard upon the canvas as various thin wisps of white can be seen on the floor and walls which helped blend in the darker tones that were painted for the shadows. The artist has painted the farthest figures in blurriness with minimal detail and focuses on the basic outline for the facial expressions. The walls also take on a hazy over layer that blends the warm scene in dim shadow and this also ensures depth in the image.